Set against the backdrop of China's explosive economic growth over recent decades and the rapidly changing urban environment, an exhibit featuring 12 contemporary projects by international architecture firms was held in Beijing last week. The exhibition dubbed "Unmade in China: Architecture Undone in the PRC" was unveiled in Shanghai in April. It was held in Beijing at the four-hectare 751 D-Park Plaza between September 28 and October 6 and is now destined to tour major cities in the US and Europe. American architect and the exhibition's curator, Michael Tunkey, told Metro Beijing China's economic growth had "positive and negative sides." "The whole purpose of the exhibit is to look at it honestly, specifically what we can improve and learn from examining the negative side," said Tunkey, who is also the principal of architecture and interior design firm Cannon Design. "If you only focus on the works that get built, you are not seeing many of the problems with the works not getting built." 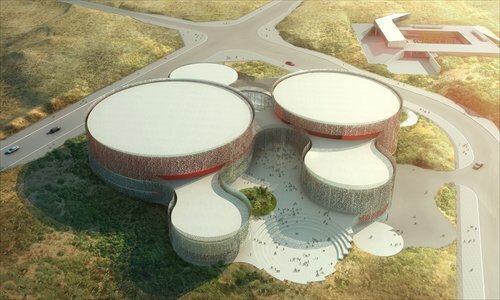 The exhibit's dozen models include the design of the giant Ordos Performing Arts Center in North China's Inner Mongolia Autonomous Region; the Observation Tower, a tall, slender tower supported by buttresses in Central China's Henan Province; and Longtan Park, a 20-hectare residential area at the foot of a Karst mountain range in Liuzhou, East China's Jiangxi Province. There are many reasons why the designs have failed to be realized, but in China it is difficult to pinpoint the exact cause as the decision-making mechanism is quite opaque compared to other countries, Tunkey said. "Many developers in China start to meet with architects before they actually have the property, so they use the designs as a way to secure development rights. For many of the projects, clients don't have the site and it isn't a done deal. This doesn't often happen in the West." Architects in the West have been stifled in recent years due to sluggish economic growth, but China on the other hand has presented them with unprecedented opportunities. The image of China's booming metropolises is often reliant on iconic structures, but Tunkey argues Chinese city planners are too preoccupied with pace. Restless demands from city planners can quash creativity among architects. While it might take 15 years between sketching blueprints and laying the finishing touches on structures overseas, this process is often fast-tracked to just three years domestically. "A lot of the steps are missing [in China]," noted Tunkey, adding in the US and a lot of European countries every design detail must overcome lofty legal hurdles and lengthy waiting times for government approval. "Here, the leader in charge approves the project quickly meaning the overall process is sped up." Architects, many both excited and confused at the opportunities China presents them, are encouraged to think big, act bold and experiment with cutting edge designs without being hindered by red tape. Having worked in China for over a decade, Tunkey admitted he has never become accustomed to the lack of procedure. But it pays to adopt a pragmatic attitude, he added. "If you are flexible you can get a lot of things done in China," he said.